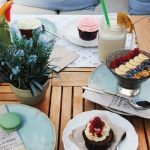 Must-visit places in your first 48 hours in Madrid. Madrid works its magic on everyone who visits this charming city. Looking for the best way to soak up the atmosphere with your kids? Let Kids in Madrid provide a few pointers. Madrid has a wide range of family-friendly hotels, guesthouses, bed and breakfasts and youth hostels. There are also a surprising number of self-catering rural getaways that have excellent transport links to the city centre and are worth considering especially if you are visiting in the hotter months of July or August. Right in the city centre, a minute’s walk from Plaza Mayor, is the incredibly comfortable, welcoming and accommodating B&B Petit Palace Posada del Peine. With family rooms that fit up to 6 people, a variety of baby equipment to borrow if necessary, and free breakfast for children in a family room, this boutique guesthouse is a cut above the rest in the same price bracket. Along from Sol and onto Gran Via is our favourite city centre hotel with a pool, the Catalonia Gran Vía. The family rooms sleep four and have fold away bunk beds, making the room spacious. The pool, though small, is for the exclusive use of guests – unlike other city centre hotels which allow non-guests paid passes for daily entry. The knowledgeable hotel staff are quick to help families make the most of their stay in the city, arranging tours and booking tickets to see football matches or flamenco shows… the choice is yours! In the Literary Quarter / Paseo del Prado area of Madrid is the always dependable hotel La Pepa Chic, close to Atocha train station (home to tropical garden with terrapins that children love to see, as mentioned in a previous article about things to do in Madrid), from where you can discover the delights of the nearby Retiro Park, museums and tapas bars. 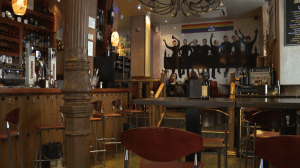 In the same neighbourhood is Mercure Madrid Centro which has the added bonus that it arranges babysitting for couples who would like to go out for an evening and leave their children in good hands. Some of their rooms have terraces with seating areas outside, perfect for kids and parents alike. Opposite the best gluten-free cafeteria in Madrid are the most sought-after holiday apartments in Madrid. Home Suite Alfonso Apartments consistently achieve the highest score on all customer evaluation sites. There are so many details to love about these homes from home from the fact that they have a range of books, DVDs and music for children and they offer hypoallergenic pillows, to the joy of discovering their outdoor dining area and terrace. The word-of-mouth reputation Alfonso Apartments has built among expats like ourselves on the KIM team is excellent. Perhaps off the radar of the usual tourist recommendations, but definitely worth considering, is the excellent Hotel T3 Tirol which we’d like to highlight precisely because of its location. Bearing in mind how much children love to be outdoors … and how much parents want to get sight-seeing done … this hotel’s unique location allows families to take a stroll along beautiful Paseo Pintor Rosales which runs parallel to a gorgeous landscaped park, past the intriguing Templo de Debod, over to the viewing platform where you can see the beautiful palace and cathedral to the left whilst straight ahead you see Madrid’s equivalent to Hampstead Heath, the Casa del Campo public estate. If time permits, you can take a cable car ride over to the Casa del Campo, which hides among its eclectic mix of wild acres and landscaped zones a zoo, a municipal outdoor pool and an amusement park. Among the other advantages of this hotel is the children’s area, the kids breakfast and the carefully designed “kids rooms” within the family room. Madrid is an awe-inspiring city with an unexpectedly coherent beauty which draws the attention of even the most reticent youngster. There is much to see and admire in this city full of tree-lined avenues, street musicians, terrace bars and monuments. 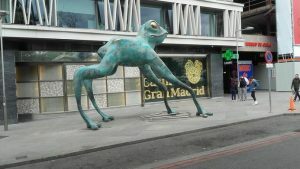 Thinking like a child for a moment… who wouldn’t find the enormous and incongruous frog statue on Paseo de la Castellana opposite Plaza de Colon fascinating? At the Nuevos Ministerios end of the Paseo de la Castellana is the Hand Sculpture by Fernando Botero, which many families stop off to see on their way into town from the airport when they arrive to Madrid (Metro Line 8 connects the airport with Madrid city centre via Nuevos Ministerios). For the Spanish-speakers among you, check out this list of monuments which include the bronze statue of a street-cleaner (close to Sol) and a leather-clad granny in the Vallecas district of Madrid. Whilst wandering around the Golden Triangle of Art many kids stop and stare at the vertical garden growing up one of the walls of the Caixa Forum building. When walking through Puerta del Sol, families stop to have their photograph taken next to the Oso y Madroño statue of a bear hugging a tree. Meanwhile, close to the palace, there is an Egyptian temple whose fountains are a genuine temptation for children who fancy a paddle! 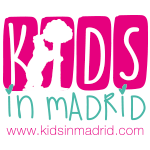 We at Kids in Madrid love going on walking tours of the city, and have mentioned some of our favourites in a previous post (click here for details). Recently our friends at Devour Madrid re-launched their popular Madrid Kids Walking Tour to much critical acclaim. Children get to try Spanish ham and eat churros along the way – always a real hit! Finally, you could try contacting Madrid and You for a bespoke, child-orientated city tour in English which is a truly unique, entertaining and a time-saving gem for families on a sight-seeing excursion. Otherwise, why not go for a wander yourselves? You’ll be surprised how many children’s playgrounds there are, even in built up areas like Plaza Luna and Plaza Tirso de Molina – incidentally, home to a flower market which is a sight of beauty in itself. With three different tour routes to choose from and brand new electric vehicles to ride, Tuk Tuk Madrid is a popular choice for families, although only suitable for two adults + two children. Cycling tour options include Bravo Bike and Mi Bike Rio, both of which have been tried and tested by Kids in Madrid. Mi Bike River also offers tandems, tricycles and karts to hire. Although their website is still only in Spanish, their tour guides are native English speakers and those handling bookings also speak English. Finally, the hop-on, hop-off city tour buses are the best way to guarantee seeing all the sights at your own pace. Good food and family friendly service is guaranteed in almost every restaurant in Madrid. 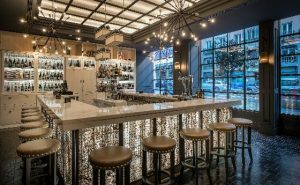 To mention just three places, all of which provide Spanish delicacies for children to enjoy, we would recommend La Buha for the best tortillas in Madrid whereas for croquetas try one of the four Txirimiri restaurants dotted around Madrid. For a traditional madrileño three course meal – with mountains of food – we highly recommend La Gran Tasca, where tourists are made to feel very welcome among the local diners there to enjoy the best cocido in town. Yum! Visiting The Retiro is all well and good, but your kids are more likely to remember Madrid Rio with its toboggan slides, its rope bridges and crazy swings, rather than the sometimes over-crowded Retiro Park. Madrid Rio is a 7km long park the runs parallel to the River Manzanares, and it has children’s play areas dotted all the way along. As mentioned in a previous post, this park is a top hit for kids. Combine your walk along Madrid Rio with a visit to the Campo del Moro park to see the western façade of the palace and find the peacocks that wander freely therein. Have you got any other suggestions for the first 48h in Madrid? Leave them in the comments section and check our blogs for more content related to living in Madrid!